Should the Capitol police have shot this woman to death? (Red dot to the far LEFT) A woman in a black car attempts to pass a barricade near the White House. She speeds away, and officers pursue her; (Red dot to the far RIGHT) Her car crashes into a barricade. Shots are fired, and the woman is killed. A woman who tried to force her car through a White House security fence Thursday afternoon was shot and killed by police after a 12-block chase past the Capitol, which was locked down for a half-hour, authorities said. The suspect — a dental hygienist with a history of mental issues, according to sources — had an 18-month old daughter with her who was not hurt, police said. 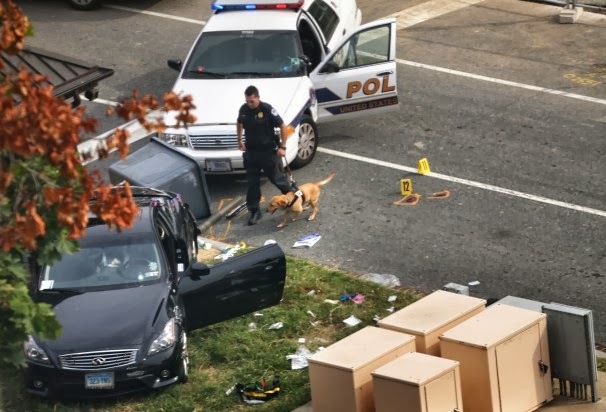 One Secret Service officer was struck by the woman's car, and a Capitol Police officer was injured when he slammed into a barricade during the pursuit. The unidentified police officer was treated and released Thursday night from MedStar Washington Hospital Center. All the shots fired came from the officers involved in the pursuit, and the woman — identified as Miriam Carey, 34, of Stamford, Conn. — did not have a gun, law-enforcement sources said. "She was using the car as a weapon," one source said. Dramatic video showed officers with guns drawn surrounding the woman's black Infiniti before she suddenly sped away. Several shots could be heard as cops took off after her. “This appears to be an isolated singular matter with no nexus to terrorism,” Capitol Police Chief Kim Dine said at an evening news conference as police and FBI agents converged on the woman's condo complex in Stamford. President Barack Obama was briefed about the harrowing incident, which came in the midst of the government shutdown that has created a tense atmosphere on Capitol Hill. t started at 2:18 p.m. when Carey tried and failed to breach a White House checkpoint, a temporary "outer perimeter" fence at 15th St. and E St. NW, officials said. As she fled east on Pennsylvania Ave., she struck a Secret Service officer, and a chase ensued. Witnesses to the Capitol Hill shooting describe what they saw and heard. Capitol Police caught up to her at Garfield Circle near the Capitol reflecting pool, but she sped off again. An officer in hot pursuit struck a barricade and was hurt, officials said. The 12-block chase ended at Constitution Ave. and Second St. with Carey mortally wounded, police said. The child was removed from the car by a police officer and taken to the hospital. The woman's motive was unknown, but investigators said they believe the woman may have been mentally unstable. Other reports suggest that she had a history of mental health issues. Carey’s apartment in Stamford was swarmed by the FBI and various law-enforcement agencies Thursday evening, with helicopters circling and a bomb squad ready, as they awaited a warrant to search the premises. Silva, told FoxNews.com she couldn’t believe Carey may be the woman involved in Thursday’s shooting at the Capitol. "She had post-partum depression after having the baby" she said. She added, "A few months later, she got sick. She was depressed. ... She was hospitalized." Idella Carey said her daughter had "no history of violence" and she didn't know why she was in Washington, D.C., on Thursday. She said she thought Carey was taking Erica to a doctor's appointment in Connecticut. I would never in a million years believe that she would do something like this," he said. "It's the furthest thing from anything I would think she would do, especially with her child in the car. I am floored that it would be her."